To hear the mind behind such esoteric games as Killer7 talk of making a “game that’s kind of new” is somewhat unexpected: that game was nothing conventional. The blending of a film noir-esque plot with third-person movement and first person action, mixed further with rail shooter mechanics is certainly not a typical mix, especially when you factor in the the aesthetics chosen by Suda to embody the action. Indeed, if he thinks that he is able to make something that is “kind of new”, it must be something special. Lollipop Chainsaw is just that: something special. It would not be any exaggeration to say that I have not experienced anything like it. It is this uniqueness that has led to its mixed coverage in the gaming press, with reviews ranging from five-out-of-tens to nine-out-of-tens: those scoring on the lower end, however, are missing the point. Much will, inevitably, given the current context of video games coverage in the mainstream press, of the fact that the protagonist of the game, Juliet, is dressed in the ‘fucktoy’ mould of female video games characters, with many of the unlockables available in the game being a variety of skimpy outfits for those with the predilection to do so to dress Juliet in. In a less self-conscious game, this would scream (no doubt in a suitably feminine-histrionic fashion) lazy misogyny in character development. Juliet’s persistent skimpiness only speaks to objectification if you view it in isolation: in the context of the game, however, it is undoubtedly Juliet’s disembodied-head-as-boyfriend Nick who is made the object. He is transported by Juliet, on one notable occasion in spite of his strongest objections, as an accessory, with her family referring to him as passively as Blanche on the Lam‘s Blanche’s masters refer to her and treated as a toy by one of her sisters. Suda’s virtuous habit of liking to make a point with his games shines strongest here in Lollipop Chainsaw: he has developed this brashly stereotypical American cheerleader character, epitomising all of the crimes against women that contemporary video game developers tend to churn out, more than likely aware of the backlash that this may incur. Nick’s ‘powerful’ jock stereotype is undermined by the loss of his body, leading to the comparative empowerment of Juliet: Suda manages to turn expectations about the type of characters which are to be put across by his writing on their head in a brilliantly subversive way. Yes, Juliet is incredibly dim and characterised as attractive above all else, but Nick is her opposite, and neither character should be taken seriously independently. 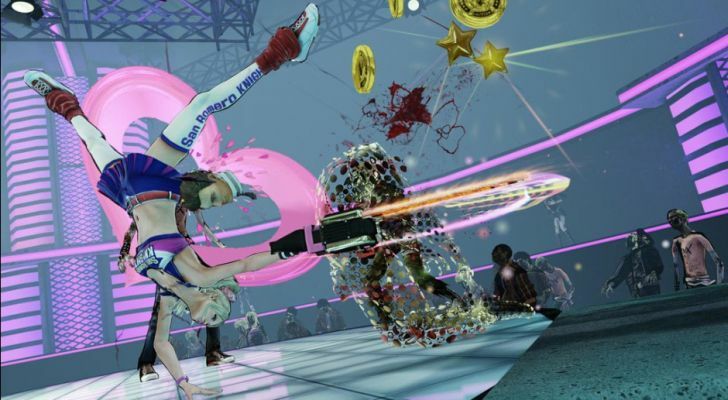 Comedy is the ultimate aim of Lollipop Chainsaw: in his other games, Suda has sought to make humour an addition to proceedings, but here he makes it abundantly clear that his aim is to be ridiculous. The grindhouse-meets-cutesy-rainbows-and-hearts aesthetic combined with the sheer incredulity of the way in which Suda interprets the high-school-loner-gone-made trope in the storyline underscore the degree to which the game takes the initiative in dealing with its subject matter. In acts of fan service to those who play the game merely out of a penchant for zombies in media, an awareness of the key contemporary franchises in zombie films pays dividends in enjoying the writing of the game: a remark is made upon the an encounter with zombies on treadmills which is a transparent homage to the 28 Days zombies (“Running zombies? What kind of idiot came up with that?”) and the game as a whole seems reminiscent of Sam Raimi’s Evil Dead franchise in the way that it deals with humour in a dark setting. The game is also not afraid to play with references to its own media: in one stage, homage is paid to both Pac-Man and Pong in mini-games. Its grindhouse references are played up by references to the work of Quentin Tarantino in the trophy/acheievement “Zed’s Dead, Baby, Zed’s Dead” awarded following the successful completion of the first boss battle. This furthers the case for the game being incredibly self-aware in its humour: something that transforms what would be a reaction of disgust at its ridiculousness and turns it into something wonderful. Juliet’s limberness makes for some interesting moves. In terms of gameplay, Lollipop Chainsaw is more familiar than its aesthetic and story. The stylistic action is strongly reminiscent of the Devil May Cry series: you have a large set of enemies and walls prevent you from leaving the area until all are dispatched with. Enemies come thick and fast, and short of dodging Juliet has very little in the way of defensive maneuvers. 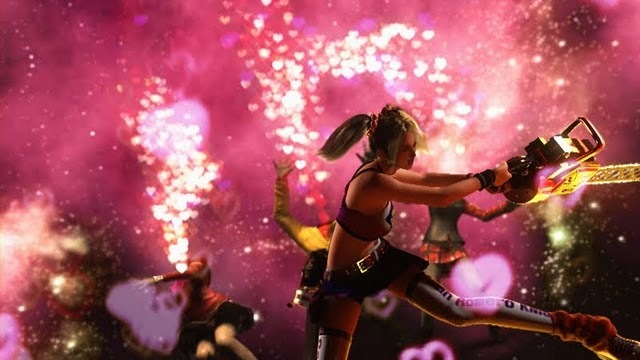 Juliet starts the game with a homing close-range attack, which utilises pom-poms alongside her limbs and a choice of low and high chainsaw melee attacks, all of which can be upgraded at the in-game shop where the medals obtained by the elimination of enemies can be spent. New abilities are also unlocked throughout the game, including interesting tricks involving Nick’s head and a long-ranged weapon in the Chainsaw Blaster. Gameplay is the typical combo-learning and executing you’d expect of the action/hack-and-slash genre, but that is no bad thing: the game is fluid and has a smooth learning curve, with the difficulty of the game increasing as your repertoire of abilities increases with gameplay becoming increasingly satisfying as the more complex combos become available to you. The mechanic of Sparkle Hunting (a state of affairs that occurs where three or more zombies are killed at once) adds further challenge: performing this act bestows the player with a greater number of medals and is one of the only way to obtain platinum medals, which are used for purchasing the aforementioned costumes for Juliet, if that is your sort of thing. One complaint, however, must be made: the game is a little too reliant upon quick time events for some elements of gameplay (those where you control Nick, the more scripted sections of gameplay and, most frustratingly, the final boss battle). This is nothing new in the gaming world, though, and is to be expected from a game that has its eyes split across zombie films, Devil May Cry and God of War: it is not to be lauded however – anything that takes control away from the player cannot, to my mind, be congratulated. The sheer level of detail in the level and character design is phenomenal: each of the end-of-level bosses has a character that is drawn into both their appearances and attacks, from Zed’s emotive screaming being used as a weapon to Josey necessitating the player to complete a game of Simon if one is victim to his attacks. The levels are large (around forty minutes each) and varied enough to keep even the most ADHD-riddled brain occupied for such a spell. The game over screen is also a nice variation on the idea: a cartoonish animation of Nick mourning the passing of his incredibly thick girlfriend. Much has been made of what people perceive to be ‘dated’ graphics in the game, but given the amount of action taking place at any given time, such a sacrifice is made worthwhile by the fact that the game never feels anything but smooth in its framerates, even in the most hectic of action. As much as people may moan, the best has been made of what the current generation of hardware has to offer. The game is a short one, however, clocking in at around six to eight hours for the story mode. The game’s salvation comes in its ranking mode, unlockables and classmates available to rescue: all serve to add a fair amount of replay value to the title. The ranking mode is a hark back to classic high-score beating compulsion, and suits the game’s focus on style and good practice throughout gameplay. Though this is replaying the same content, there is nothing about this game that would not make someone want to do so – there is always more to see and better ways to play. Lollipop Chainsaw is a rare kind of experience, and one that all who play video games should experience. GAME OVER SCREEN ANALYSIS: Nick mourning over the cartoon grave of Juliet is humorous and in keeping with the theme of the game – irreverent and satirical of the role (or lack thereof) actually played by Nick.